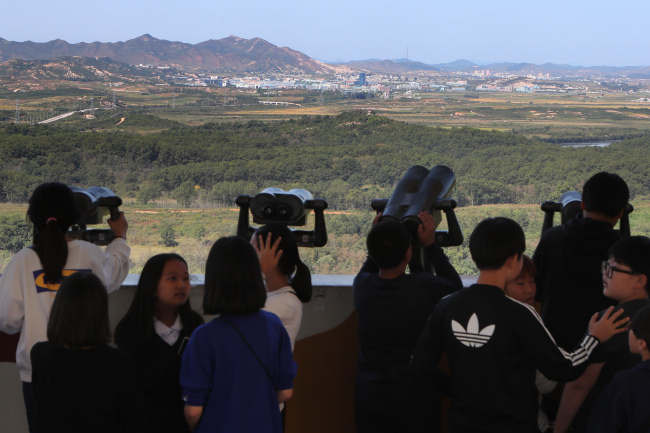 Signs of vehicle movement and electricity use within the joint industrial park in the North Korean city of Kaesong have been detected since March, Seoul’s Unification Ministry revealed Tuesday, amid growing concerns over the North’s unilateral operation of the zone. The ministry warned that the North should refrain from operating the complex without Seoul’s consent, stressing that South Korean firms hold the property rights to all factories and machines there. “The government takes the basic stance that North Korea should not infringe on South Korean firms’ property rights,” said a ministry official Tuesday. “We’ve made clear that all factories and machines in the zone belong to the companies here,” he added. Buses were spotted entering and leaving the complex and lamp posts were seen used for the past six months, the ministry revealed. However, the resumption of operations at the industrial park are still only “suspected,” as there is insufficient evidence, stressed the ministry. “Seoul plans to make a fact-finding effort to determine the situation. If local firms apply to visit North Korea to check their assets, the government will consider whether to approve their requests after gauging various factors,” the ministry official said. The North’s resumption of the Kaesong industrial park would be clear violations of the inter-Korean agreements that guarantee South Korean firms’ assets and the latest UN sanctions targeting the North’s textile exports. The US-backed Radio Free Asia recently reported that the North had started operating 19 textile factories within the complex. Reportedly, about 58 percent of the South Korean companies there did textile-related businesses. On Friday, North Korea’s propaganda outlet Uriminzokkiri hinted that North Korea had resumed operation of the Kaesong industrial park saying that “it’s nobody’s business” what it does in the zone, where its “sovereignty is exercised.” It also vowed to run the factories more actively and to show how its citizens are currently working “with confidence” there. Another government official added that there is a possibility that North Korea may be using its own electricity to power the complex, as South Korea cut off all water and electricity supplies after closing the industrial park in February 2016. Korea Electric Power Corp., South Korea’s state-run power provider said Tuesday that South Korea has not been providing electricity to the complex since its shutdown. It said that the 124 local firms that had operations in the industrial park have not been paying their bills since they evacuated the complex last year, therefore it was logical for the state-run provider to suspend all supplies to the zone. Meanwhile, South Korean operators who ran businesses and factories in the complex will hold a meeting and a press conference Wednesday to share their stance on the matter. Kaesong industrial park was closed in 2016, under suspicions that revenue generated there was funding Pyongyang’s nuclear and missile program development.